Many newswires and financial websites take the most recent quarterly distribution and multiply by four to determine the “yield” of the variable distribution refining MLPs. For example, on the FINVIZ.com page for CVRR they are currently showing a yield of 21.79% (which is $1.58 times 4 divided by $29). On Monday FINVIZ may update its info to use the $1.35 2Q13 distribution that was just announced, if they updated it right now they would calculate a yield of 18.62% (which is $1.35 times 4 divided by $29). We are a variable distribution MLP and we do live in a volatile business and these numbers can move overnight one way or another rather significantly, so I would suggest that you take what we give you for operational performance and take your own view of the markets as we go forward. The best way to look at their hedging in future quarters is to compare the amount of volumes hedged for a quarter to the projected amount of production to figure out how much they are hedged on a percentage basis. 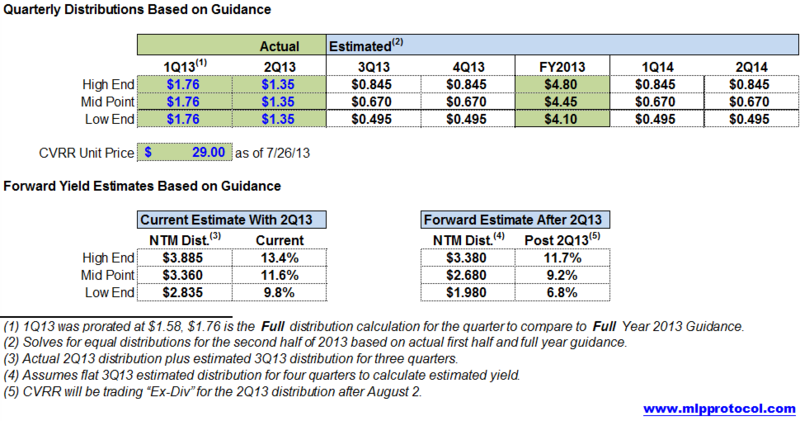 As far as guidance is concerned in the post I discuss their entire history of guidance and show how it has changed over time (with the most recent change being to lower their guidance for full year 2013). If you have something specific that I may be able to help you with please feel to email me directly the exact scope of work that you require so I can give you an estimate on what it would cost. My contact info can be found in any of the Weekly Snapshot reports. Thank you a lot for your letter and CVRR estimates. What is your price idea for CVRR for next 6 month, based on 4.10/ share distribution ? If CVRR will lower its distribution it will effect even more CVI price since guidance for both CVRR and UAN are lower. I am looking POT, MOS fall and downgrades for most of fertilizers could effect UAN sales. the price of most fertilizer companies. Dec 2013 price of corn is under $5.00 / bushel vs $ 8.00 in 2012 and farmers can not afford to pay more for UAN than before. I will be very thankful for your input and any additional information you cn share with me and willing to compensate you for your work via Paypal . Yes that’s right, what matters for the quarterly performance is the average realized crack spread for the entire quarter at each specific refinery location. I think the point the CEO was making was that the crack spread is very volatile so “market conditions” are constantly changing. As a case in point, just look at how much CVRR’s internally prepared guidance for 2013 has changed over the last six months and how big the margin of error has been in their guidance. Thanks for the update on CVRR. Do not own, but am long CLMT, NTI, and ALDW. But aren’t they averaged over 90 days?